But it can't be from Dolly Clackett. She gave me an Easter egg! : I'll have a pint. Of wine. I'll have a pint. Of wine. All is well with me right now, which is a really nice thing to be able to write. I had to go to London yesterday for a meeting, which was very good, and afterwards we went out for lunch, which was even better. It was a bit bittersweet because two of the people I have worked with closely over the past six months will be leaving next week, and I'll miss them, but it was good to hang out with them at lunchtime. I decided to come back up to Leamington early and beat the rush and work on the train, but by the time I got home I was SERIOUSLY grumpy because I was so cold. It was a beautiful day, so naturally Chiltern Railways decided to turn their air conditioning up to the Icy Blast setting. Nothing will get me grumpy faster than being cold, and yesterday I spent three hours in a refrigerated container - not nice. I'm going to complain to Chiltern because it's really uncomfortable and it's such a shame, because their service is excellent in every other respect. However, they should know that it's just too damn cold on their trains, I think. 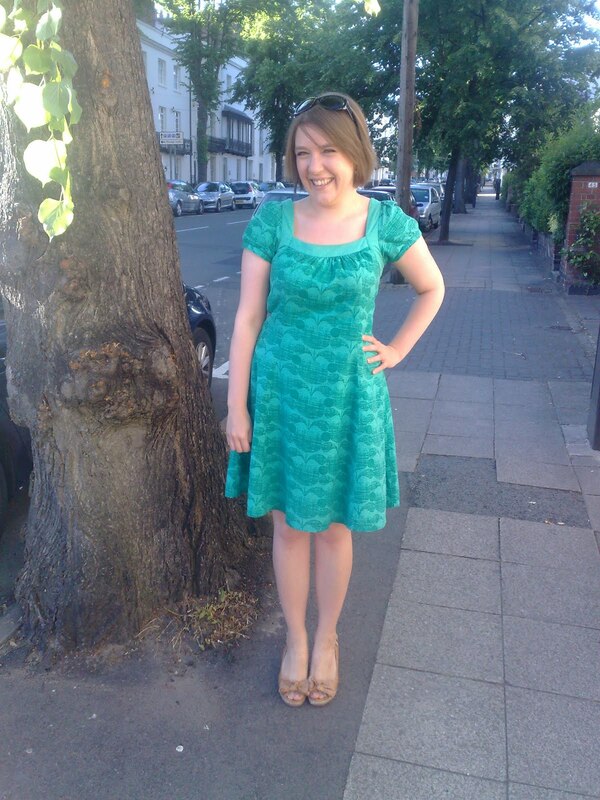 Numph Summer dress and the wedges are from Debenhams via Oxfam. I haven't worn this dress for ages, but I love it. I don't make a habit of taking photos of my food (although, I should have taken a photo of those amazing salads from the Relais Gascon) because I'm usually too excited about the tastiness. I couldn't really do this justice - it was apple and blueberry crumble and it was (to quote Nessa) immense. 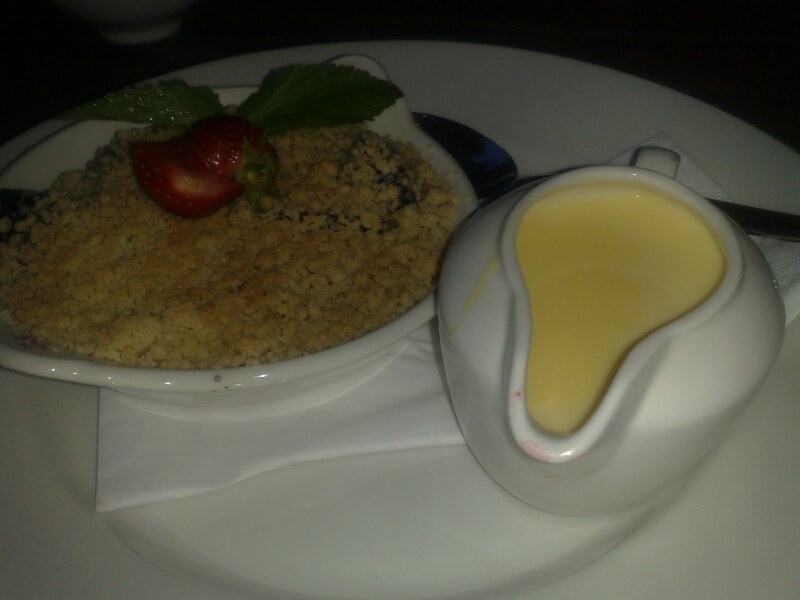 The Scientist had his with ice-cream, but that's not how I do things so I asked for custard and it was lovely too. It was just so nice to hang out with friends - it might sound stupid, but when I get stressed I avoid doing this, and it's obviously the best way to destress! The walk back through the fields in the darkness was gorgeous, and I slept so well as a result of the exercise, the tasty food and all the laughter. I'm going to see my girls Sugar Plum, Martha and Caroline this afternoon, and then hopefully lots more people over the course of the Peace Festival. Louise might come over as well, hurrah! I'm rereading Anne's House of Dreams and Nic bought me a Rose Tremain book yesterday that I'm going to make a start on. The most important one of all. Ewwww, how cheesy am I? !